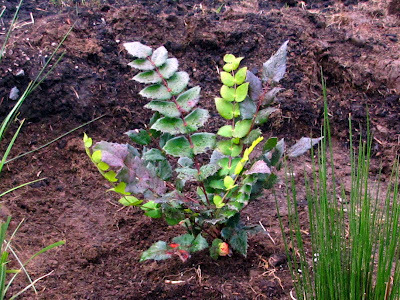 Just a girl with a hammer: Say yes to mahonia! My sister-in-law and I chatted recently about how we've both been reluctant to put Oregon grape in our yards. I see it in landscaping underneath big trees and it looks leggy and sad (not to mention it's pokey and I'm clumsy, a bad combination). But then I saw this guy at Portland Nursery and I wanted to buy five of them. So pretty! So colorful! Evergreen! I've placed it in the dry zone of the new rain garden where hopefully it will spread and stay bushy. 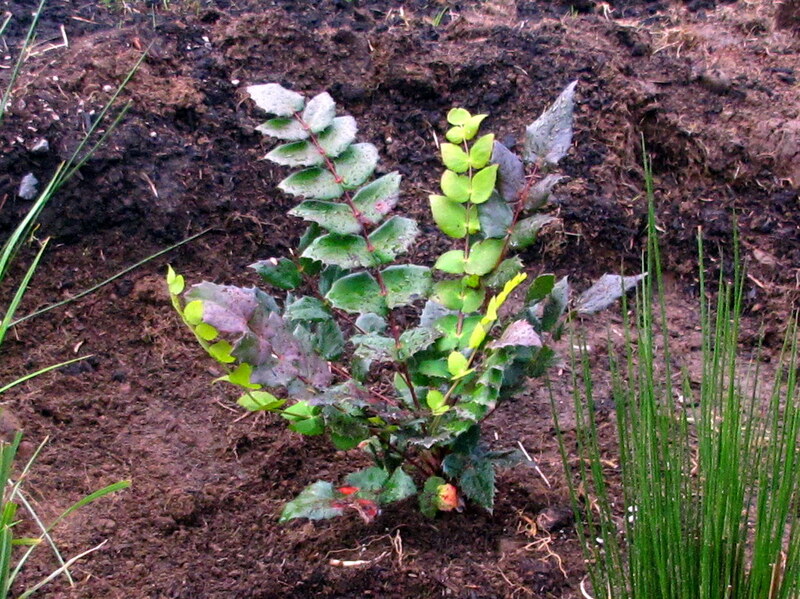 I'm also plotting the inclusion of a Mahonia x media 'Arthur Menzies' for structure behind the rain garden. Any other great varieties I've been missing out on? It's big and beautiful; might be just the thing for the back of a border, etc. Ooh, I know just the spot for that. Even better that its flowers are fragrant! I think you will love Arthur Menzies. When I bought mine at an HPSO sale, the checker said she always thinks of it as Sergio Mendez. And now I'll think of it as Sergio too. :) That's so much better! I've got the leggy,pokey,sad Oregon grape...it only remains because it is too spiky difficult to remove. I like my Mahonia gracilipes, with its cool white undersides, and M. fortunei 'Dan Hinkley' with narrow, serrated leaves, more like a Ming Aralia. Both can manage with less sun but want more water than the M. nervosa it looks like you have. Wow, that M. gracilipes is GORGEOUS. I think I need to find a spot for those in the backyard, where they can get a little shade. How did I miss out on this genus for so long? Was it always sad and leggy? I'm worried mine will get established and then let its looks go.